This is the most popular Hogsback climb. It delivers sustained and wandering 5.6 moves up the tallest part of wall. The routefinding can be tricky so follow the topo closely. On the second pitch, the route climbs over some scary stacked blocks then makes a tricky 5.6 left. For a harder variation, climb the splitter finger crack above the stacked blocks. High on the second pitch, a traverse right avoids the direct 5.7 variation. While it appears tame, the direct 5.7 variation does require some awkward moves on small gear. 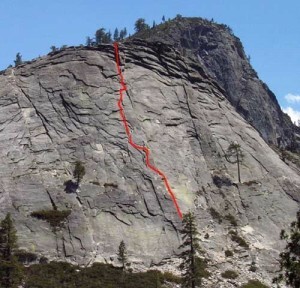 The route can be climbed in two pitches if you set the first anchor after climbing more than 150 feet. Which SuperTopo guidebooks include a topo for Deception?